Click on your device for more information on how to subscribe, buy a single issue, or set up your digital account. Click here to validate your current subscription and establish your digital account. If you've already set up your digital account, proceed to step two. Download and install the TIME iPad app from the App Store. The app will download to Newsstand, which is its own icon on the iOS desktop. Tap the Newsstand icon and the TIME app icon will be on the Newsstand shelf. Enter the email address and the password you set up. Forgot your password? Click here. Tap LIBRARY to view and download available issues. 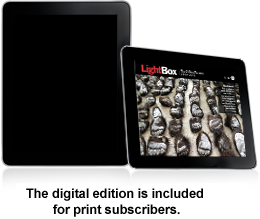 You can enjoy each issue of the digital edition as long as your subscription remains active. The TIME iPad app requires iOS6 or higher. On your Kindle, go to the Amazon Newsstand and find TIME magazine. Enter your account number, mailing address, or digital account login information. You will now be able to view and download available issues. TIME subscriptions cannot be setup on the first generation Kindle Fire. Kindle and Kindle Fire are trademarks of Amazon.com, Inc. or its affiliates. Visit BN.com and, using your BN.com account, order your NOOK™ subscription by tapping or clicking "Subscribe Now." Go to the NOOK™ store on BN.com or on your NOOK™ and find TIME. Using your BN.com account, order your NOOK™ subscription by tapping or clicking "Subscribe Now." After you submit your NOOK subscription order, you will receive an email from Barnes & Noble with instructions on how to verify your subscription. Follow the instructions for current subscribers. You will have 14 days to validate your subscription by entering your subscription account number. If you do not validate your subscription within 14 days, you will be charged for your NOOK order by Barnes & Noble. NOOK is a registered mark of Barnes & Noble Inc. NOOK Tablet and NOOK Color are trademarks of Barnes & Noble Inc.
Go to the Google Play Store and find TIME magazine. Tab "Subscribe," and then choose "For current subscribers." Enter your personal information and tap continue. Verify your subscriber status by entering your address or account number and tap continue. Agree to Google Play's Terms of Service and tap Accept & subscribe. To ensure the highest-quality experience for subscribers, we are always reviewing new devices for the TIME digital edition. For more information or if you have additional questions, please contact customer service at 1-866-784-9818 or click here .